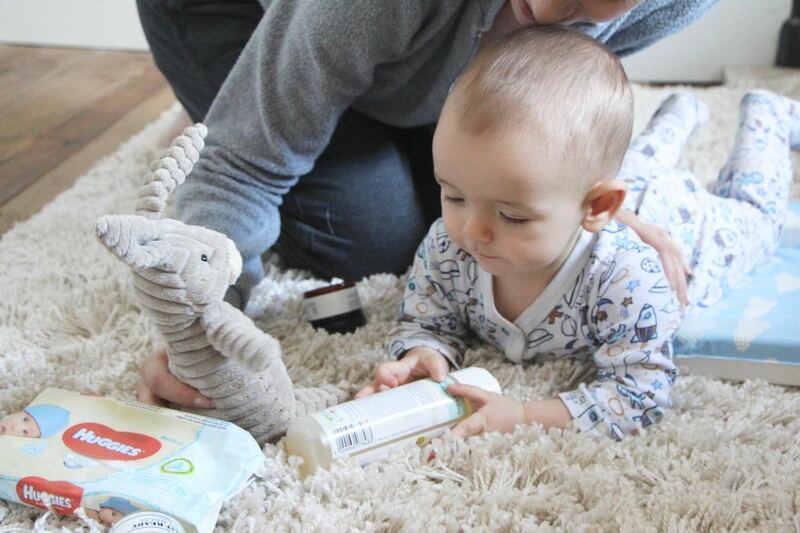 This is my third and final post with Huggies Pure Wipes and I wanted to talk about how nappy-changing time can be one of the most important times of the day in terms of connecting with your baby and having a bit of fun. If you have an absolutely jam-packed schedule of child-watching and food-cooking and house-keeping and admin-doing and all of the other stuff that we typically have to squeeze into the waking hours, you can sometimes forget to stop and stare at your baby. Really look at them and engage. I don’t mean to say that if we’re busy we neglect them the rest of the time, but nappy-changing means that we are really close to them and, unless they’re wriggling off the mat every two seconds (Ted) or flipping over onto their fronts (also Ted) we get to look at them straight in the eyes. One on one. Hello baby! Instead of just rushing through the nappy-changing process, here’s what I try to do to have a bit of time out and make it more fun. Because Ted hates having his nappy changed, up until the point that I put the new nappy on and start doing his vest poppers back up! The only time he laughs during changing is if he wees on me and I scream, so I try to do the following things to keep it enjoyable. Usually after the dirty nappy has been removed and the new one has been done up, to spare me from the aforementioned wee incidents. Play “This Little Piggy” with his toes. Ted has just about started to enjoy the piggy-toe thing. Angelica never got it and won’t let me do it now, but Ted has a good giggle when the piggy goes to market, or stays at home, or has roast beef. Can I raise an objection to this game, though? NONE does not rhyme with HOME. I don’t know whether it’s supposed to, but it sounds as though it should, and the fact that it doesn’t bothers me a lot. This little piggy went to market, this little piggy stayed at HOME. This little piggy had roast beef, this little piggy had NONE. Every time I do it, I want to rhyme none with home – sort of like known. This little piggy had no-wun. It annoys me every time. I need to get out more. Improve his co-ordination via potentially frustrating means. I used to like to place objects around Ted’s person so that he had to turn to get them, or dangle them above so that he had to reach up – it kept him occupied for minutes on end, which was useful if it was a particularly bad nappy. Now that he’s on the move, I definitely don’t want him twisting about to reach things so I dangle them above and let him keep them (ie gnaw on them violently before bashing himself in the face with them) which buys me a bit of time when I’m performing the potentially hazardous old-nappy-out-new-nappy-under manoeuvre. Quite often he’s happy with the wipes packet, because he likes to rustle the plastic and it’s a good chunky size, but I keep things fresh with various spur-of-the-moment accessories. A slipper. A clean nappy. The handle from a wardrobe that is missing its handle (oh that’s where it went). Do long-hair Peekaboo. You don’t actually need long hair to do this, you just need enough of it to form a face-veiling curtain when you drop your head down. The hair hides your face and then you pull your head up straight and – Peekaboo! Oh God. I saw myself in the mirror doing this and I realised that I look really freaky when I do it – a bit like the girl climbing out of the well in The Ring. Especially if I’ve just washed my hair. Poor Ted. I need to smile more when I do Peekaboo, otherwise it’s all a bit sinister, isn’t it? It’s also a good time, at any baby stage, to give them a good check over and make sure that the skin in the nappy area is well cared-for. 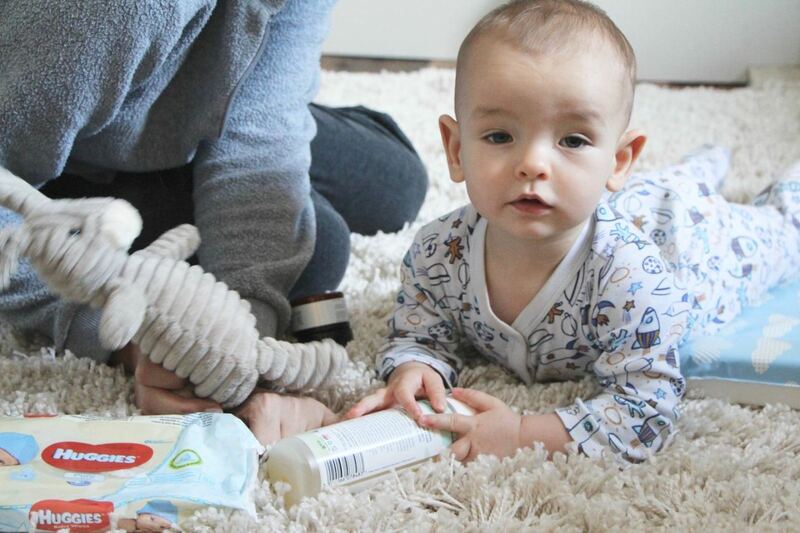 I mentioned some of my most-used baby products in the second post with Huggies Pure Wipes, including some brilliant nappy creams, but the choice of wipe itself is also really important. 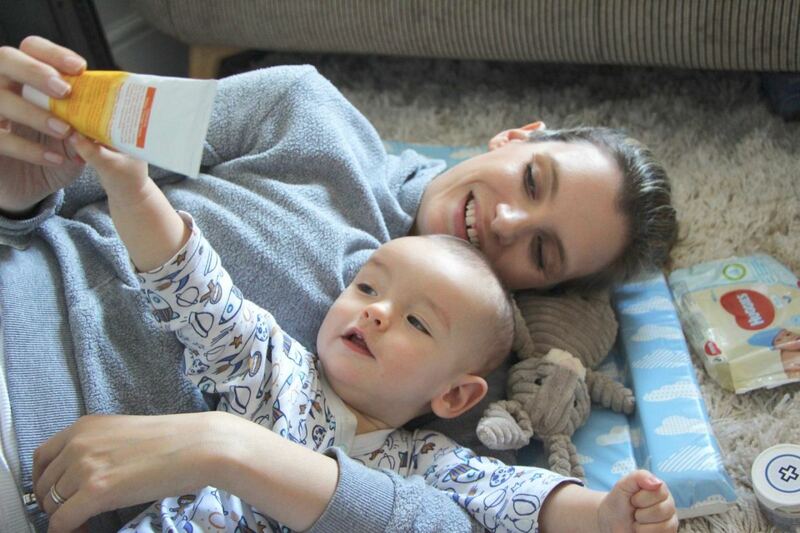 This whole post series came about after discussing with Huggies the idea of caring for the skin with wipes, not just cleansing it – making sure that the wipe is soft and gentle. After all, if you’re using wipes then it’s multiple times a day and you want to make sure that they are kind to babies’ skin. Huggies Pure Wipes are made with 99% water and with natural absorbent fibres** – they’re also free from parabens, phenoxyethanol and perfume and can be used on newborns from day one. So a gentle wipe and a lovely cream to keep the skin protected (I use Weleda Calendula, see the second post) and a check over the creases and bits and bobs to make sure that everything is dry and fresh and there’s no redness or soreness. It’s like a mini Baby Body MOT. And that’s my little routine! What do you do during nappy-changing? Are you a rush-through-it-as-fast-as-possible sort of person, or do you take your time, staring into their lovely little eyes as you do up all of the poppers on the sleepsuit the wrong way and then curse when you have to start all over again? Do you sit there, slowly caressing their little legs as you try not to fall into an exhausted stupor, or do you have everything done within thirty seconds, nappy changed with almost military precision? Tell me. Along with more poo anecdotes, because I greatly enjoyed those last time, thanks.